Like most roleplaying video games produced in Japan, Phantasy Star II casts the main character as a swordsman. Rolf is only character able to swing these large, single bladed cutting weapons. 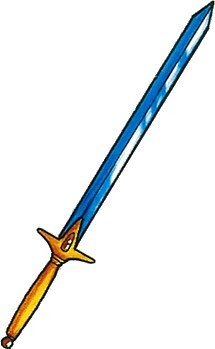 There are many variants acquired during the adventure, but the game manual illustrated on this weakest of swords. One thing the game does do differently than most others is to delay the introduction of the basic sword for a little while. Typically, the main character would begin with a sword already equipped or locate one in the first few minutes of a game. Not in Phantasy Star II, though - here one has to work for it a bit, using smaller weapons like knives or daggers. Fun fact: Rolf's animation for sword-swinging is the same animation as when he uses a dagger. Rolf: Ha ha, look who has a sword now! Poor Hugh again !! Also, Amy swooning with hearts in her eyes, lol. Swords are good weapons, but the knives and daggers can be just as deadly and sometimes more easily handled. Give me one o' them!!! Thoul, you're right, in many RPGs the hero started tyhe adventure with a sword ! But in Phantasy Star III...there is a knife for Rhys early in the game !